It is critically important to teach undergraduates about biology more effectively and to retain more of them in scientific and health careers. My lab addresses this issue by examining two broad questions: How do college instructors teach? How do college students think about biology? Prior research shows that certain teaching strategies are more likely to promote engagement, retention, and learning among diverse students, but it has been difficult to examine the strategies instructors use on a large scale. Therefore, in collaboration with San Francisco State, we developed DART (Decibel Analysis for Research in Teaching). 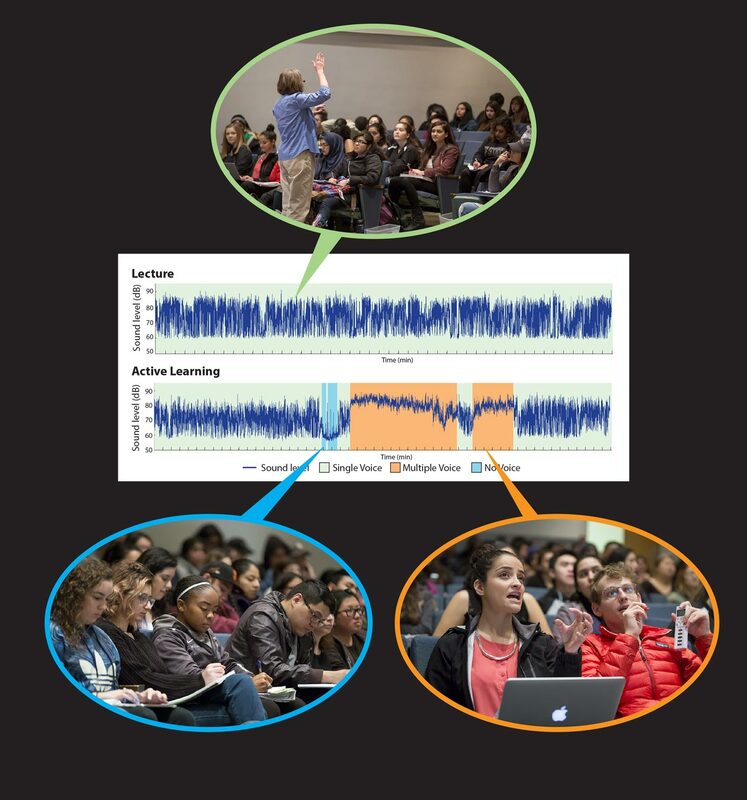 DART (dart.sfsu.edu) is a software tool that can quickly analyze classroom audio recordings to estimate with ~90% accuracy the time spent using certain teaching activities. We use DART to investigate a variety of questions, with the goals of better understanding how instructors teach and promoting evidence-based teaching practices. DART uses classroom sound levels (dark blue line) to estimate the extent of "active learning" by classifying class time into these categories: Single Voice (e.g. lecture), Multiple Voice (e.g. pair and group discussions), and No Voice (e.g. student thinking or writing). Students learn more effectively when instructors know what ideas their students already have. In particular, previous studies reveal that students often harbor misconceptions that inhibit their ability to develop biological expertise. Many misconceptions are rooted in ways of intuitive thinking that predate modern scientific thought. We are particularly interested in how undergraduate students understand and reason about health topics, such as vaccines. We ask undergraduates about their ideas about specific topics and examine their misconceptions and the types of reasoning they use. We will use our results to design education interventions to promote better learning about these topics. Melinda Owens is passionate about effectively helping all students learn biology. After receiving her PhD in neuroscience from UCSF, she taught at a range of institutions, including Stanford University and California State University, East Bay. She then was a SEPAL Postdoctoral Fellow in Biology Education with Kimberly Tanner at San Francisco State University. She joined UCSD in 2018.